Preservation New Jersey and the New Jersey Jazz Society are pleased to welcome the New Jersey Jazz Quartet back to the 1867 Sanctuary Arts and Culture Center as part of our jazz music concert series! 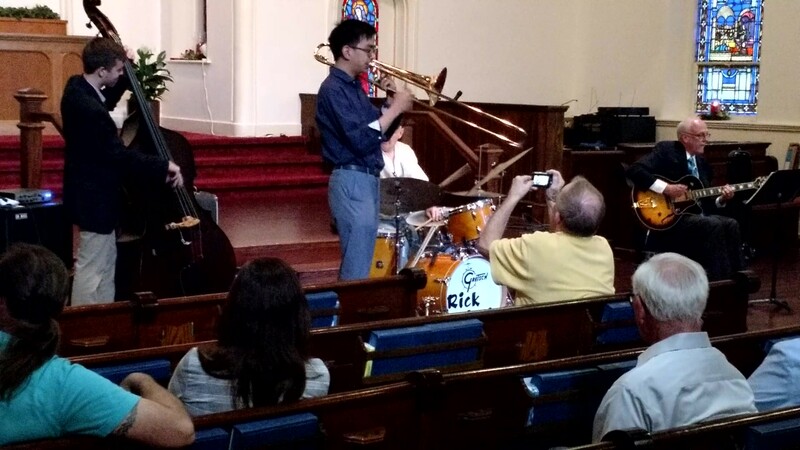 The New Jersey Jazz Quartet features Charles Frantz (Guitar), Rick Fiori (Drums), Tom Littwin (Bass) and Peter Lin (Trombone). They play always enjoyable straight-ahead jazz standards of Miles Davis, Coltrane, and others. Charles Frantz, guitarist, is Director of The Conservatory of Music where he gives private guitar and piano instruction. He received his Bachelors and Masters degrees from Temple University and a Doctorate from Rutgers University. At Rutgers, he studied guitar with Ted Dunbar. He has played solo guitar and ensemble jazz venues for 40 years throughout the Tri-State area. At The Conservatory of Music, Charles Frantz has offered group workshops in jazz guitar chord melody, improvisation and voice leading. Originally from Baton Rouge, Louisiana, Taiwanese-American trombonist, Peter Lin, has been recently described by Downbeat Magazine as “solid, fluid, and smooth”. He received his B.A. Music from William Paterson University and MM for Jazz Trombone Studies at Rutgers University. 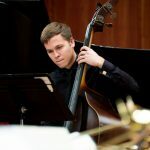 He was involved with Jazz House Kids for three years as both the Assistant Manager of the Summer Workshop as well as the Manager of the Emerging Musicians Program. Deeply rooted in the trombone tradition, he has studied with jazz luminaries such as Slide Hampton, Curtis Fuller, Conrad Herwig, and Steve Turre. As a featured soloist and sideman, Peter has performed with world-class jazz artists including Slide Hampton, Steve Davis, Winard Harper, Charli Persip, Anthony Nelson Jr., Wayne Escoffery, Johnathan Blake, Josh Evans, Valarie Ponomarev, Jack Jeffers, Kenny Davis, Steve Williams, and Radam Schwartz. Most recently, Peter Lin performed at Slide Hampton’s 85th Birthday with Steve Turre, Kenny Barron, Rufus Reid, and Victor Lewis. With various groups of all musical genres, he has performed at venues and festivals including The Clifford Brown Festival, The Riverview Jazz Festival, The Brooklyn Hip-Hop Festival, the Blue Note, Dizzy’s Club Coca-Cola, Smalls, Duke’s Southern Table, Zinc Bar, and Swing 46. He also leads his own jazz small group, The Lintet, which remains active in the tri-state area. In addition to being an active performer, Peter Lin is a dedicated educator, teaching in both the private lesson setting as well as the classroom. His students have gone off to college such as Montclair State University for music. He also has worked at the Jazz House Summer Workshop, the Jazz Arts in Red Bank, Newark Academy’s Summer Jazz Camp, and at Andy’s Family Music Center. 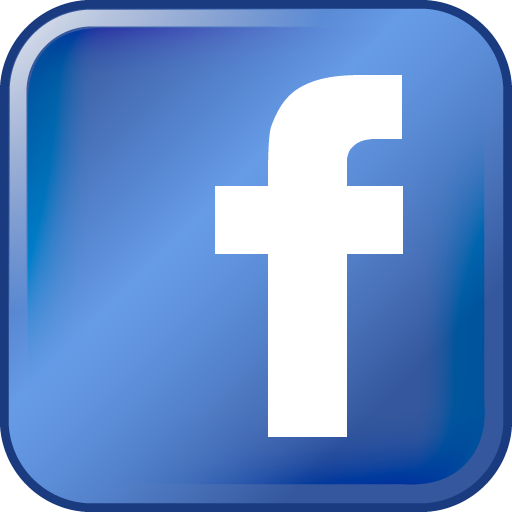 He also founded the “NJ Jazz Sessions” page on Facebook, which advertises all jazz jam sessions in New Jersey. Tom Littwin began playing bass at the age of nine when students at his elementary school were allowed to choose an instrument to study. Littwin decided that he wanted to take music seriously after being accepted into The Pennington School in the sixth grade. At The Pennington School, Littwin participated in the schools Jazz Band, Orchestra, and Blues, Pop, Rock Ensemble throughout both middle and high school. Around the same time Littwin started at The Pennington School he started going to a Philadelphia bass only store called Bass Specialties. At Bass Specialties Littwin attended many clinics, master classes, and private lessons with bass greats such as Victor Wooten, Marcus Miller, Janek Gwizdala, Gary Willis, Steve Bailey, and Gerald Veasley just to name a few. Bass Specialties is also the location where Littwin began studying privately with Anthony Wellington. Littwin was also given the opportunity to study at many bass camps. In 2007, he attended Victor Wooten’s Bass/Nature camp in Nashville, TN. He also attended Gerald Veasley’s Bass Boot Camp in 2008, 2009, 2010, and 2013. After graduating high school Littwin began performing with many different artists in the Philadelphia and New Jersey music scene. Most notably Littwin gigged locally and recorded with the late Clifford Adams, jazz trombonist and member of Kool and the Gang. Littwin was awarded a degree in Music from The College of New Jersey. At TCNJ, Littwin has performed with great musicians such as saxophonist Richie Cole. Littwin Performs with TCNJ’s Jazz Band and Orchestra while also performing at other events in the New Jersey and Philadelphia area. Littwin also is an adjunct faculty member of The Pennington School’s music department. 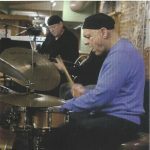 Rick Fiori, drummer, is the founding member of the Rick Fiori Swing Band, has toured extensively with his own and other bands, and has taught in music studios and private instruction. He has performed with the Sonny Stitt Quartet/Quintet and the Tommy Dorsey Revival Band. He has also been a student of Tony DiNicola, Marty Morell of the Bill Evans Trio, and others.